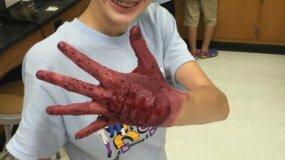 Newly revised this year with our Zombie theme, and more exciting than ever, campers learn the science behind Hollywood’s special effects. Activities will demonstrate concepts related to light, sound, perception, illusion, and model building. One of the great features of this camp is that all campers will create (and take home!) a movie using techniques in Claymation and Stop-Motion Animation. Lessons include plot development, story boarding, set building, filming, and sound effects. Please have your moviemaker bring a 4GB USB to camp to save their movie, as well as an old button down adult-sized shirt.